One of the best ways to stay productive, is to make sure your sewing room/space stays organized. When your stuff is easy to find you’ll spend less time looking for things and more time crafting! Use storage containers with clear drawers to organize sewing notions. The clear drawers allows you to see what’s inside them without having to rifle through everything. The red unit is the type you buy at a hardware store; the white ones can be bought from your everyday, big-box store such as Target or Wal-Mart. Keep all of your cutting and marking tools contained, yet close at hand. This crock is perfect for holding scissors, pencils/pens, sewing gauges, turning tools, etc — it’s heavy enough that it won’t tip over and wide enough to fit a large amount of stuff. It sits on the corner of my cutting table so my rotary cutters are always within reach. My husband’s Aunt gave this to me years ago (it’s a piece she made), I love that I get to look at it almost every day! Take advantage of unused space! I used some of the removable 3M hooks to hang my rulers on the side of the bookshelf. The bookshelf sits directly next to the cutting table so my rulers are within reach when I’m cutting (they’re also right next to my cutting tools). I was continuously losing my rulers within stacks of fabrics so this has worked out fantastically! Organize your fabric so it’s easy to see! I put smaller pieces of cotton in these square cubbies, grouped (somewhat) by color. 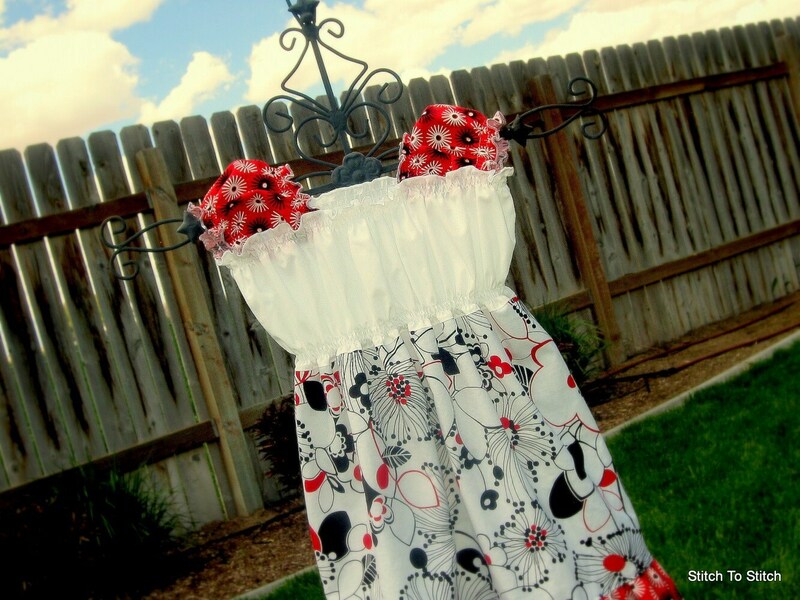 Larger pieces are wrapped on fabric organizers and stored in laundry baskets or clear storage containers. Just be careful of direct sunlight to avoid fading your fabrics. You can always store them in closed cabinets, colored storage containers or fashion a curtain to keep them out of harm’s way. With my sewing room being in the basement, the direct sunlight into the room is limited; my fabrics are stored directly under the window so they are shadowed by the sun coming through the window. Running now through midnight on Sunday 9/11/11 — select prints from the Amy Butler Soul Blossoms line are 25% off at Fabric.com. And remember that all orders over $35 ship for FREE. 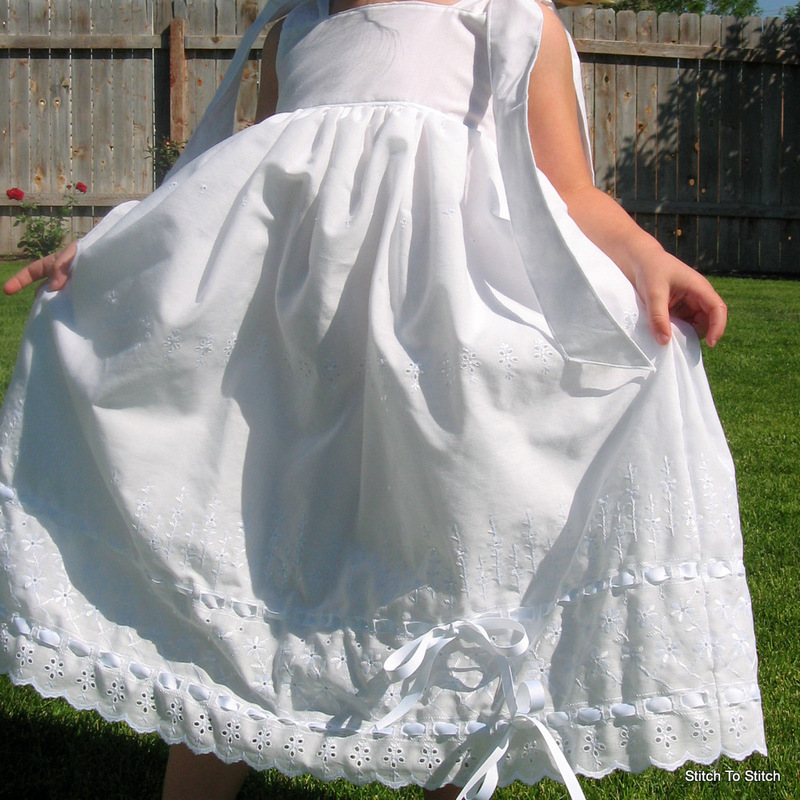 In the last year, the most popular item in my shop has been the Eyelet Sundress with the double ribbon detail on skirt. When I first created this item I never knew it would be such a great seller! 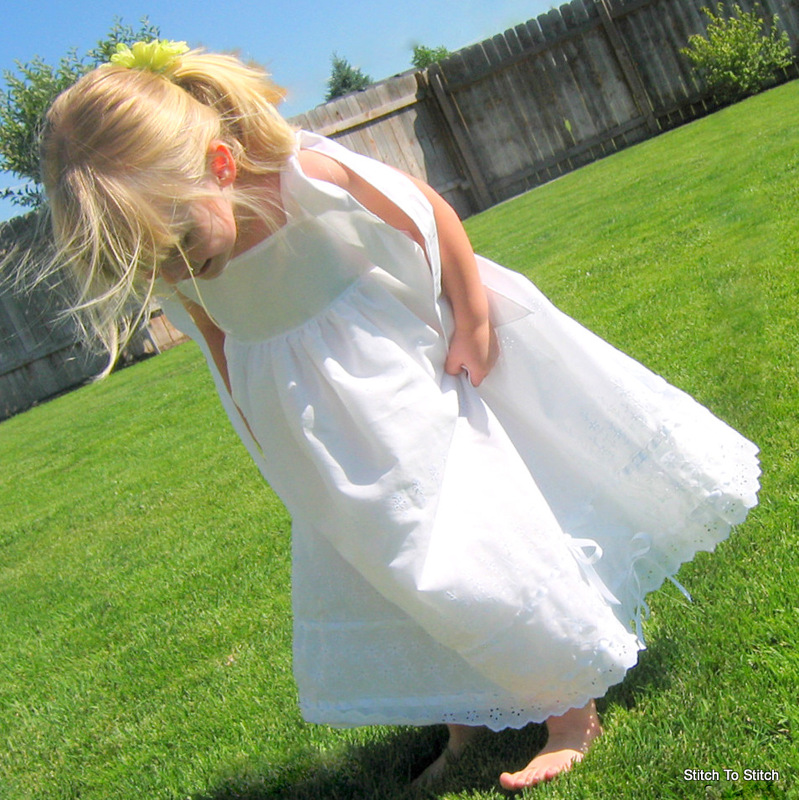 They work beautifully for flowergirl dresses and I’ve sold through yards and yards of this beautiful eyelet fabric. Unfortunately, the fabric is no longer available from the source! I’m down to about 6 yards in my inventory — enough to make about 3 more dresses, give or take depending on the sizes. So if you’ve been eying them, make sure to purchase one while they’re still available. Once the fabric is gone I’ll update the listing, changing the dress to use eyelet with the single ribbon detail (shown here in the pillowcase dresses). Peasant Top — Now in More Colors! 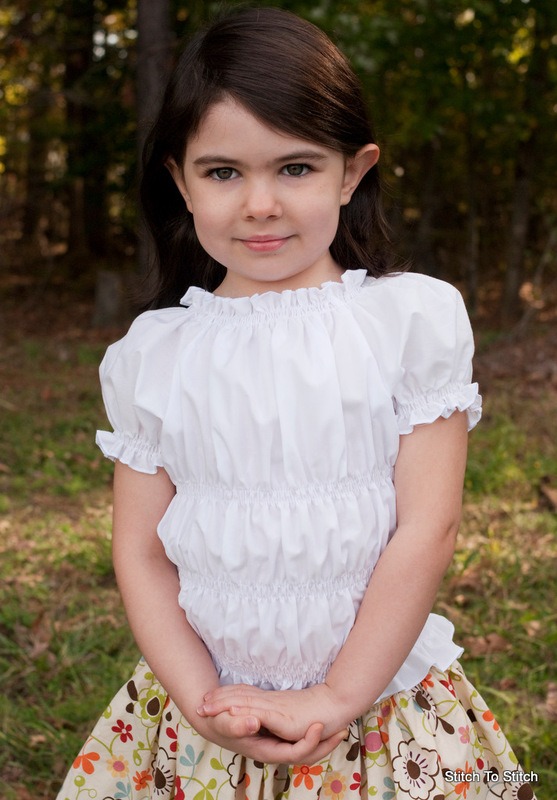 This top is the perfect addition to your little girl’s spring/summer wardrobe! And one of my all time favorite pieces to make. 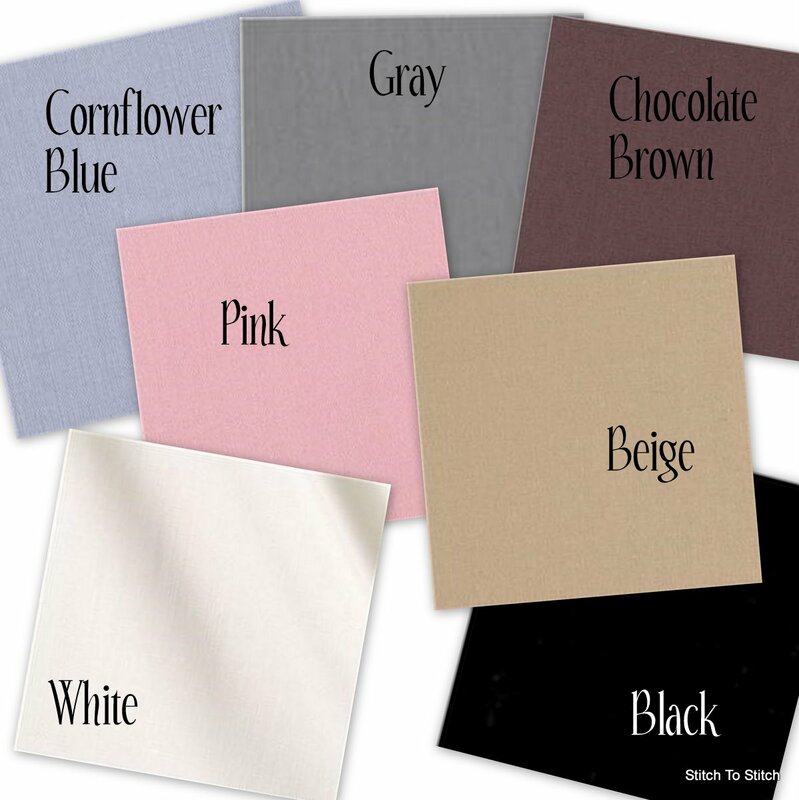 If there’s a color you’d like that I don’t have listed, I’ll gladly try to find it locally at no extra charge. You can see the full listing here in my Etsy shop. At just over 2-months old, Baby Girl seems to have this inane knack for waking up as soon as I sit down at my sewing machine (or serger). It’s as if she hears the click of the power switch as I toggle it on from the other side of the house, through numerous doors and walls, and her eyes snap open in response. The hard part is that she’s still in the stage where she’d much rather be held than anything else. Not just held though, but held while the holder is walking around the house, bouncing with each step. This magical dance that must occur makes it difficult to accomplish much of anything. (One of these days I should attach a pedometer to my hip to track my movement around and around and around the house.) It seems to be a rare occurrence where she’ll sit in her bouncer chair for 10 minutes, lay on the play mat long enough for me to go to the bathroom alone or even be content to hang out in a sling or wrap, tight to my chest. I know though, that this time in her infancy is fleeting and before I know it, she’ll be asking for my keys and to push curfew as late as she can. So I try to sew in short 10-minute burst when possible and enjoy the time she wants to be in my arms. The biggest downfall is that I’m spending more time on the computer buying fabrics and patterns than I am sitting at my machines creating adorable outfits. With spring starting to show its smiling face in many parts of the country I need to get cranking out some new items. Today through midnight ET on Monday March 7th you can get Michael Miller fabrics for 15% off at Fabric.com! This price includes all of their Micheal Miller in-stock quilting fabric, flannel, knits AND minky. All orders over $35 have free domestic shipping too. So go do some fabric shopping.